The word “community” appears, by my rough count, 98 times in Mark Zuckerberg’s latest message to the masses. In a post-fact world, truth is approached through repetition. The message that is transmitted most often is the fittest message, the message that wins. Verification becomes a matter of pattern recognition. It’s the epistemology of the meme, the sword by which Facebook lives and dies. Today I want to focus on the most important question of all: are we building the world we all want? It’s a good question, though I’m pretty sure there is no imaginable world that all of us would agree we want, and if there were one, I’m entirely sure that Mark Zuckerberg is not the guy I’d appoint to define it. And yet, from his virtual pulpit, surrounded by his 86 million followers, the young Facebook CEO hesitates not a bit to speak for everyone, in the first person plural. There is no opt-out to his “we.” It’s the default setting and, in Zuckerberg’s totalizing utopian vision, the setting is hardwired, universal, and nonnegotiable. Facebook stands for bringing us closer together and building a global community. When we began, this idea was not controversial. The reason the idea — that community-building on a planetary scale is practicable, necessary, and altogether good — did not seem controversial in the beginning was that Zuckerberg, like Silicon Valley in general, operated in a technological bubble, outside of politics, outside of history. Now that history has broken through the bubble and upset the algorithms, history must be put back in its place. Technological determinism must again be made synonymous with historical determinism. Infrastructure is destiny. (The word “infrastructure” appears 24 times in Zuckerberg’s message.) Society is not a fluctuating arrangement of contending and at times noxious interests brought into a tenuous equilibrium through a difficult, ongoing process of negotiation and struggle. Society is itself a technology, a built thing that, correctly constructed, “works for all of us.” Get the specs right, and the human community will scale as a computer network scales. Global harmony becomes a technological inevitability. Zuckerberg’s conflation of religion and sports is odd but illuminating. In his view, the tenets of a religion matter no more than the rules of a game; what’s essential about a church and a sports team is that they both form social infrastructure that serves to “bring us together and reinforce our values.” It’s only by separating individual beliefs from community formation, and then pretending those beliefs don’t really matter, that Zuckerberg is able to sustain the fantasy that all sub-communities share a set of values — values that derive from community itself, independent of the members’ motivations in forming a group. These common values play the same role in building a global community that common standards play in building the internet: they enable seamless interconnectivity. Zuckerberg remains oblivious to the fact that a sub-community, particularly a religious one, may be formed on a foundation of belief that is incompatible with, and in opposition to, the beliefs of the surrounding community. As the Wall Street Journal‘s Ian Lovett writes today in an article on a traditionalist Catholic community that has grown around a Benedictine monastery in Oklahoma, “The 100 or so people living here are part of a burgeoning movement among traditional Christians. Feeling besieged by secular society, they are taking refuge in communities like this one, clustered around churches and monasteries, where faith forms the backbone of daily life.” Such communities are very different from sports teams. Their formative beliefs aren’t some sort of standardized Lego infrastructure that enables the expression of universal community values. The beliefs of the individuals in the community are the values of the community, and they are anything but common standards. The problems with Zuckerberg’s self-serving fantasy about social relations become even more pronounced when we turn to “sub-communities” of creeps and miscreants who share poisonous beliefs — neo-Nazi groups, say, or racist groups or misogynistic groups or groups of murderous ideologues (or even groups of amoral entrepreneurs who seek to make a quick buck by spreading fake news stories through the web). Here, too, the beliefs of the individual members of the community form the values of the community — values that, thankfully, are anything but common standards. “The purpose of any community is to bring people together to do things we couldn’t do on our own,” Zuckerberg writes, without any recognition that those “things” could be bad things. Even though the actions of sociopathic groups, in particular their use of Facebook and other social networks not as a metaphorical infrastructure for global harmony but as a very real infrastructure for recruitment, propaganda, planning, and organization, would seem to be one of the spurs for Zuckerberg’s message, he is blind to the way they contradict that message. Nastiness, envy, chauvinism, mistrust, distrust, anger, vanity, greed, enmity, hatred: for Zuckerberg, these aren’t features of the human condition; they are bugs in the network. Tension and conflict, then, become technical problems, amenable to technical solutions. And so, rather than questioning Facebook’s assumptions about society — might global community-building, pursued through media structures, end up encouraging polarization and tribalism? — and the role the company plays in society, Zuckerberg ends up back where he always ends up: with a batch of new hacks. There will be new algorithmic filters, new layers of artificial intelligence, new commenting and rating systems, new techniques for both encryption and surveillance. The bugs — bad actors and bad code — will be engineered out of the system. Zuckerberg’s program, as Ars Technica’s Annalee Newitz points out, is filled with contradictions, which he either won’t acknowledge or, thanks to his techno-utopian tunnel vision, can’t see. He makes a big deal, for instance, of a new initiative through which Facebook will provide management tools for organizing what he calls “very meaningful” communities — groups characterized by passionate members under the direction of a strong leader. The example Zuckerberg offers — a group dedicated to helping refugees find homes — sounds great, but it’s not hard to see how such tools, deployed in the context of Facebook’s emotionalist echo chamber, could be used to mobilize some very nasty groups, of just the sort that Facebook is hoping to purge from its network. “The best communities in the world have leaders,” Zuckerberg said in an interview promoting his so-called manifesto. So do the worst, Mark. Toward the end of his message, Zuckerberg writes, “In recent campaigns around the world — from India and Indonesia across Europe to the United States — we’ve seen the candidate with the largest and most engaged following on Facebook usually wins.” One might think that this observation would inspire some soul-searching on Zuckerberg’s part. But he offers it as a boast. Facebook is never the problem; it is always the solution. No one wants to break a butterfly on a wheel, even if the butterfly is a billionaire. And only a fool would look to an official communiqué from the CEO of a big company for honest, subtle thinking about complicated social issues. And yet, in Zuckerberg’s long message, there is one moment of clarity, when he states the plain truth: “Social media is a short-form medium where resonant messages get amplified many times. This rewards simplicity and discourages nuance.” The medium, he continues, often “oversimplifies important topics and pushes us toward extremes.” This insight might have led Zuckerberg to a forthright accounting of the limitations of Facebook as a communications system. He might have pointed out that while Facebook is well designed for some things — banter among friends, the sharing of photos and videos, the coordination of group actions (for better or worse), the circulation of information in emergencies, advertising — it is ill designed for other things. It’s lousy as a news medium. It’s terrible as a forum for political discourse. It’s not the place to go to get a deep, well-rounded view of society. As a community, it’s pretty sketchy. And, he might have concluded, if you expect Facebook to solve the problems of the world, you’ve taken me far too seriously. 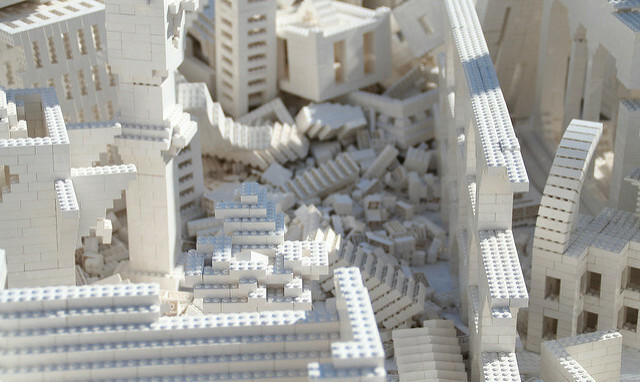 Image: “Lego City: Collapse” by Eirik Newth. This entry was posted in Uncategorized on February 18, 2017 by Nick.